Yesterday on Facebook, a friend made a lovely comment about my work. She said that I put joy into my work. I thought that was so nice of her to say that. It is not the first time someone has said that about my work. I never really thought about it like that since I am not always that joyful when I am working. I am glad it comes through that way though. This week I took a few smallish online classes with Julie Fei Fan Balzer. I just love her method of teaching. She is so funny but you really learn a lot from her. I took a short class on color. As you know I have been painting for many years but this class was a game changer for me. It was a beginner class on color. Of course we made color wheels and value scales as is always the case in learning about color. But here is where the game changing happened for me. When I first began painting in the 1970's I worked only in watercolor. In watercolor there are two colors you never use. Black and white. Yes, I know right? If you want black you mix a rich dark. My favorite go to was alizarin red and viridian green. That made a lovely dark. If you wanted white, you just let the paper color come through. That was it. When you paint with acrylics, black and white are not only used but they are NEEDED! I have found it a real struggle to use them though. I have studied how to make tinting scales (adding white to a color) and shading scales (adding black to a color). That helped me somewhat but I was still having trouble making my colors work well together. And then I took her class and I learned about making tonal colors. This is where you add grey to your colors. I wondered how on earth adding grey to a color would work but it does work and really well I might add. Some artists call this using a "mother color". The color you use when added to all your colors makes them work well together. 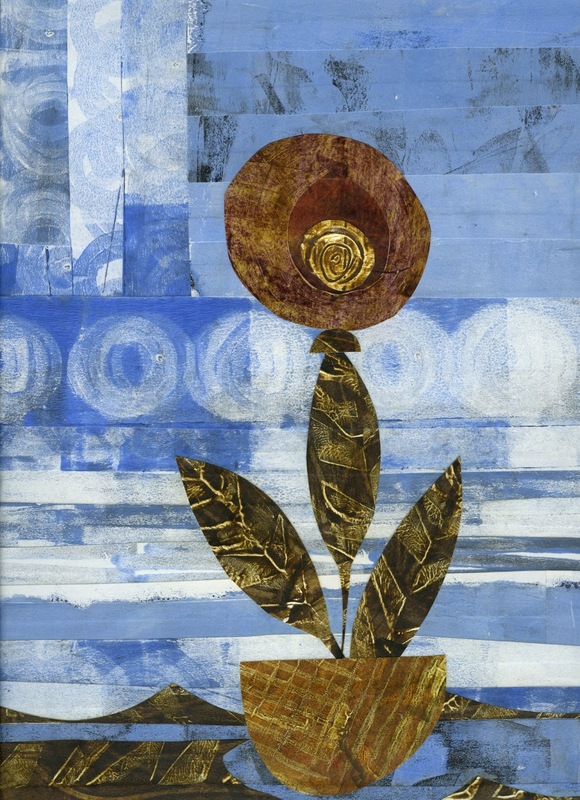 The cerulean blue in the collage above was created using this "mother color". It just helps take the edge off the colors right out of the tube without creating a muddy mess as sometimes happens when you add complimentary colors. Well, your friend must be right! I always enjoy seeing your work and it's so inspiring!!! I know I must smile when I see your work because my mouth is always in a gaping position! HA Or is that an 'awwww' position! Love your latest piece too! Some people know exactly which words to say to express their feeling when looking at art. Yes, I do feel joy when I look at your work. I comes through in the shading a color fluctuation of your colors. Even one who does not paint can see the skill and thought in your work.